A first-of-its-kind, hydrogen-powered catamaran went public at the Annapolis Boat Show last weekend. Daedalus Yachts, headed up by Google Maps creator Stefan Muff and longtime carbon boatbuilder Michael Reardon, will take the $12.5 million D80 luxury yacht to sea trials next year. The 80-foot catamaran is powered by three different kinds of clean energy. First, hydrogen is regenerated right on the boat. That means it will never need to stop for fuel. The onboard water maker takes in salt water, deionizes and cracks the molecule, and releases the salt water, giving oxygen back to the environment while keeping the hydrogen. It is stored in BMW lithium battery banks. Next, the mutihull uses solar power, featuring a trampoline made of Solar Cloth, a flexible fabric that is also used on satellites orbiting the earth, for a total of 109 square meters of solar material. The trampoline is made of Solar Cloth. Finally, turbines on the boat harness the wind. Fossil fuel is never needed. The company’s name, Daedalus, comes from Greek mythology and signifies master craftsmanship. And with its United States Sailboat Show debut, Daedalus is off to a strong start: it won a Best in Show title. I virtually explore the D80 at the United States Sailboat Show. 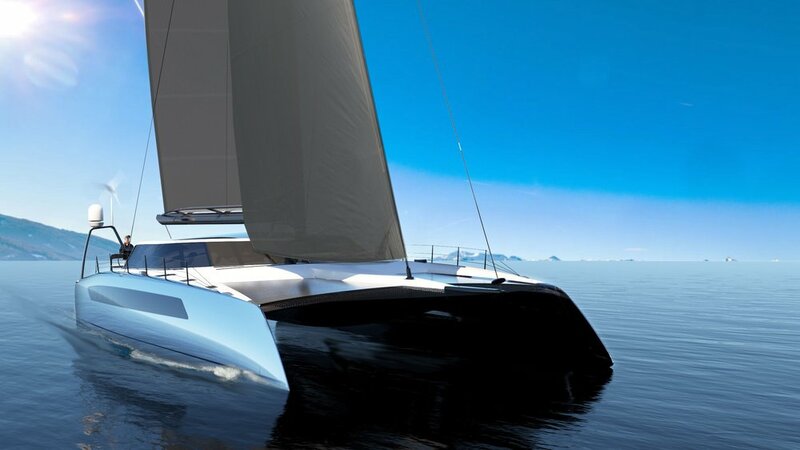 Daedalus’ place at the front edge of technology was obvious at the Boat Show: it was the only boatbuilder with a full Virtual Reality (VR) display to take visitors inside the new catamaran. Bay Bulletin peeked virtually inside the five luxurious cabins and underwater viewing room. Daedelus’ ambitious goal is to use the boat to circle the earth three times without stopping. Developing the technology to make the D80 possible has come with its challenges. Reardon tells us the company had to develop a storage tank system to hold the regenerated hydrogen. It is currently working with members of the Coors brewery family on a solution. If you missed the virtual reality tour at the Sailboat Show, you can click here for an online version (and see the site for detailed information on D80’s renewable energy system).